Home >> Generated from JAN's SOAR Information System on 4/21/2019 12:14:13 AM. 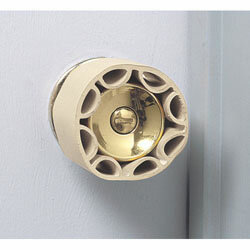 Useful for people who have difficulty turning doorknobs. The inner ribs grip the doorknob firmly while the smooth outer surface allows a gentle stroke of the hand to turn the knob. Can also be used on outdoor water faucets. Easily installed by slipping the device over the doorknob.